If you missed our previous posts in this series, you can start with Building Trust Part 1: Communication.We all have expectations of ourselves and others and they fall into one or more of the following categories: communication, character, concern, competence, connectedness, and consistency. Trust is built when we prove reliable by meeting others’ expectations in these areas. An overarching theme in the Bible, explicitly stated in the book of Ecclesiastes, is that two are better than one. Confirming this, research conducted by the Gallup Organization, whose findings are presented in the book Vital Friends, showed that people who have a best friend at work are more likely to engage customers more effectively, get more done, have greater satisfaction with their job and pay, and be less likely to leave the company. However, relational connection in the U.S. has been on a 35 year decline. Research shows that we entertain fewer people in our homes and connect much less with neighbors than we did in the 50’s-60’s. 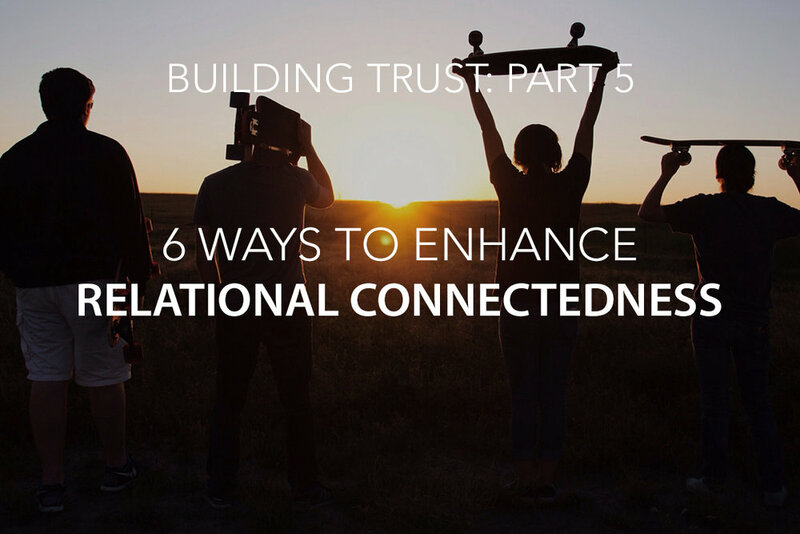 A growing concern is that just when we are realizing the need for greater relational connection from leaders and employees, they may have fewer skills to even know how to form and sustain such relationships. We sometimes have a propensity to use the way we “do relationships” with others as a standard of how others should “do relationships”. However, we are all unique. Although not everyone has the exact same relational needs or relational resources, there are universal principles essential for enhancing relational connection. The “one another” commands found throughout the New Testament have, at their core, the assumption that we must first care enough about obeying God and building relational connections with others in order to risk even trying to build them. In addition, when people treat relationships in a utilitarian fashion, people get hurt. Reciprocity is an essential function of healthy relational connection. The basic tenant of this principle is: I will do something for you with the hope that you or someone else will do something for me when I need it. While this reciprocity should never be the heart motive for reaching out to others, it is a foundational aspect of most social relationships. Vulnerability is sometimes confused with softness, especially by men. However, vulnerability is little more than sharing the truth about oneself at the appropriate time and with appropriate people. Vulnerability does require discernment, but it is not optional for building authentic relationships. Proximity is the physical location of one person or group to another person or group. For example, you are more likely to have a closer relationship with someone you have regular contact with than with someone you do not – the person who works in your department, the neighbor who lives next door, and the friend you see regularly at church. Proximity increases the amount of contact two individuals may have with one another. Time is related to how long you have known another person or group and how often you are with them. The longer you know someone, the more opportunities you have to interact, observe behavior, and express interest and concern about them. There is something powerful about relational connection. Without it, you will find increased conflict, misunderstanding, and distrust. With it, you will find greater joy, emotional health, and trust. Do you personally seek to foster healthy relational connection with those around you? How do you know? Does your organization foster an environment that values relational connection? How do you know?